I have a thing for books centered around road trips, especially if the road trip consists of a boy and girl with obvious sexual tension between the two. 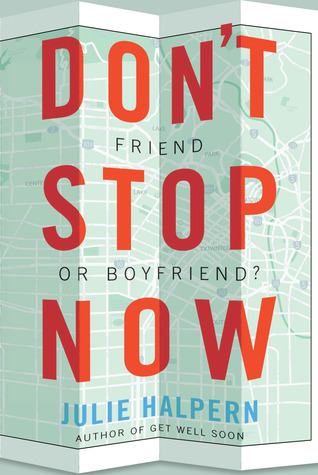 When I read the synopsis for Don't Stop Now, I knew immediately it fit the criteria for a quick, enjoyable summer read. If you're looking for something with just enough intrigue to hold you to the story, then this is the perfect book for you. Lil's friend Penny has faked her own kidnapping, but it's Lil who knows the truth about where she's gone to. Leaving Lil with this knowledge she feels the need to venture out west with her best friend Josh to bring Penny home. It's not just a journey to save Penny, but also a journey for Lil to admit her feelings for Josh before the summer ends, and the two teenagers embark on new adventures in their own lives. Their quest takes them through middle America. Making stops a long the way at the cheese capital of the world, and the largest drug store in northern America. They each buy tshirt souvenirs along the way, to remember their stops. The easy going banter between Lil and Josh was believable and made me a laugh, quite a few times. Though the purpose of their adventure was to bring Penny home, they soon realize this roadtrip stands for more personal reasons. Lil knows it's now or never to confess her true feelings for Josh. The poor boy comes across as a dense teenager; not realizing that holding hands, and playful kisses on the forehead mean so much more to Lil. As the miles stretch on, so does the tension between these two. Over all the story is one that I enjoyed; however, there were parts of the story I found to be unrealistic. I didn't quite believe Lil having the ability to just take off and venture 5 states away for the summer, alone with a boy, and her mother being ok with this. I know that wasn't the point of the story though, so I was able to look past it. I knew there was going to be an amazing climax between Lil and Josh along their trip. That anticipation kept me turning the pages. Don't Stop Now encourages you to follow your heart, be brave, and go after what you want in life. Though things may not necessarily turn out the way you hoped, in the end it has it's purpose for doing so. glad you think the book is overall worth reading - I'm always sucked in by a good road trip story too. I have a copy on its way to me and I'm looking forward to it. Excited that you loved this book! Loved the review! I want to read this book! The only road trip book I've read so far is Two-Way Street by Lauren Barnholdt. ALSO another book with YAY TENSION. I will definitely have to read this one. the closing sentiments of this review = AMAZING.